Hotels in Santiago de Cuba. 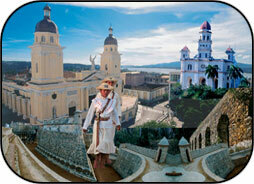 The city of Santiago de Cuba was founded by Diego Velázquez in 1515. In the first half of the 16th century it was the country's capital city and the official residence of the Spanish rulers until 1553, when it was established in Havana. In order to protect the city from the attacks of corsairs and pirates, in 1633 the Spanish authorities started building a defensive system of which the Morro Castle and the cannon pieces of La Socapa and La Estrella have lasted to our days. The city is surrounded by Sierra Maestra mountains, rendering this city a special atmosphere. A spot near its center still preserves its colonial houses and narrow streets. Padre Rico street is outstanding for its steep steps. Here you will also find the famous and visited Heredia street, named after the Cuban poet of the 19th century, José María Heredia, ending at Céspedes park. This park is located at the center of the city and is surrounded by important buildings as the Cathedral, the Museum of the Cuban Historical Ambience, the Government Palace and the house where Diego Velázquez once lived. From the Hotels in Santiago de Cuba, the visitor will have the chance of making visits to the City, Baconao National Park, Gran Piedra and the Sanctuary of Virgin of Caridad del Cobre, patron saint of Cuba. Copyright© 2015 Sun2Caribbean Corporation. All rights reserved.